Nourish- My little kitchen has been churning out quite a lot at the moment. Including the ever reliable Anzac Biscuits for when things are called for at a last minutes notice. Make these and I know I won’t turn up somewhere empty handed. Rhubarb recipes have been enjoyed, the ever present sourdough and I’m still playing with cardamom buns. So many doughy variations to play with! Grow- My mint was finally looking reasonable once more. I had conquered it. I would now have a steady supply of delicious mint infused meals. Then, I didn’t look at it for several days… a big mistake. Someone else had also decided it quite fancied some delicious mint infused meals. I found the culprit, a big dirty caterpillar, then I found another, and another. Needless to say, those minty meals will have to wait…again. Create- I’m happy to say there has been quite a bit of creating action going on round here lately. 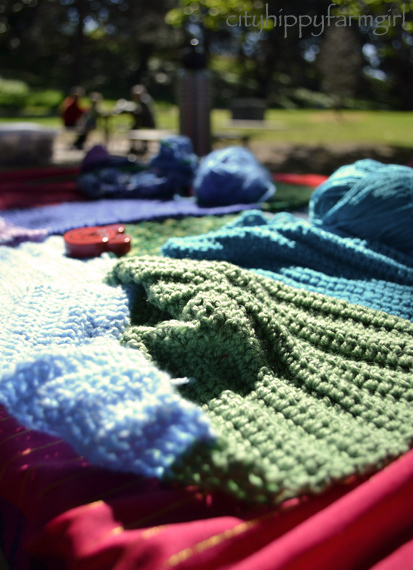 My Wednesday group’s blanket is growing, and things are slowly getting stitched together. Bunting had been planned for far too long, and finally I decided enough was enough and I just had to do it. A fine example of some shonky sewing, but I did it and I’m happy about that. Advent calendar plans are still being mused over. I wanted to do one last year, hell I think even the year before as well and I still haven’t started. Time is tick tocking, but I’m still hoping to get it together… hopefully. 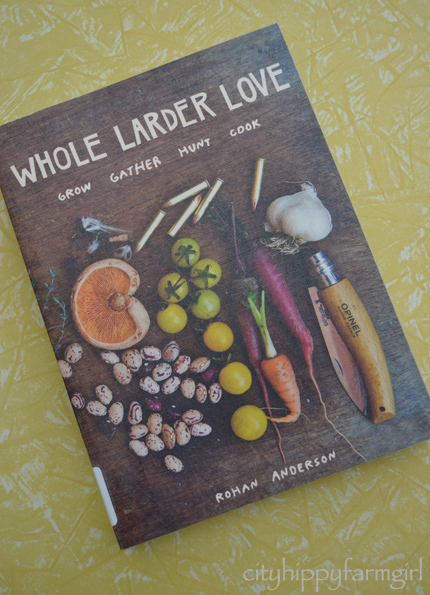 Discover- I was very happy to see that my local library had ordered in Whole Larder Love. Such a wonderful book and stunning photography by the very talented Rohan. Prepare- Eeek! Not a lot happening here. I can’t think of anything I have done to preserve this last month. I’m actually having jamming withdrawals at the moment so, I suspect some preserving is just around the corner. Stone fruits are slowly trickling in too, just the thing for a little jamming action. Enhance/Connect- Beautiful little Tasmanian wooden buttons sent to me from the lovely Mel @ Coal Valley View. Now what shall I make with them? A gathering yesterday that was so much fun, I just wanted to rewind the whole thing and press repeat- Food, lots of people big and small, all in an open green space. I also swapped some sourdough starter and some bread to another mama from school. She in turn gave me some kimchi. So much nicer than what I had bought recently, absolutely delicious. As for the starter, I love thinking about how many kitchens those little tubs of starter have travelled to. Enjoy- the year is galloping along, and this time of year finds a whole heap of enjoyable things happening round these parts….and that is a whole bunch of happy. For more slow living action, pop over to the lovely Christine @Slow Living Essentials. This entry was posted in Connecting with Community, Food Glorious Food, Rambles, Waffles and Digressions and tagged green living, slow living by cityhippyfarmgirl. Bookmark the permalink. sigh…alas my mojitos will have to wait. I don’t think mint stalks have quite the same effect. I have to laugh about your troubles with mint. Someone who owned our house before us planted mint in the flower garden… We now only have mint and a few weeds in that garden. We keep pulling it out and it keeps growing back. Oy. Kathryn, I’m happy to come and pull out your mint. I’ve seen how prolific it can grow…just not for me! 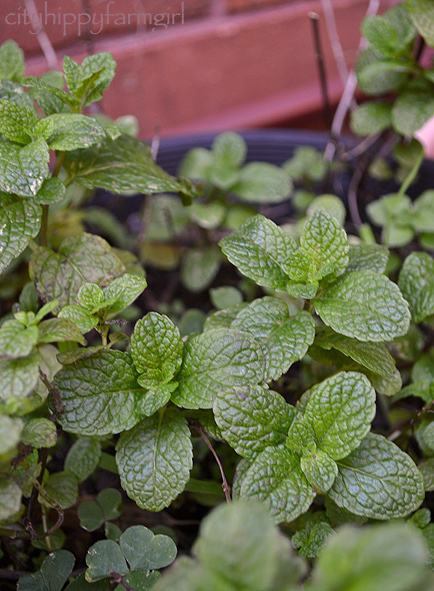 I have a patch of mint that won’t die – if you need to relocate a few caterpillars. The mint I keep in pots does ok, but the stuff in my garden keeps coming back like something in a horror movie. We called the tomato garden the triffid garden, but the mint certainly gives them some competition. I could definitely see it taking over the world. Hmm I guess you might have to hold off on a party with minty caprinahs for a bit but you have had a very busy week. Bam there is not even enough for a subtle garnish any more. I can well relate to the caterpillars on my cherry tomatoes. No sooner dealt with that problem when I spied a row of white cockatoos lined up on the garden fence. Went to inspect; not a tomato cherry in sight; totally decimated. Grrrrr. I made Anzac bikkies too; first bikkies to try in my new oven. Verdict. Yummy but too dark in colour. We’re a way off becoming in sync my new Bosch and I. I miss my old girl. How’s your mixer going? Still happy. Finally knuckled down to make my bunting. You can check mine out Brydie as I posted about it last week. Now, I have a whole heap to sew as I need about 18metres of them to decorate my outdoor area at the farm. Those buttons are gorgeous. Use to embellish calico bags, T-shirts, aprons, even your bunting pieces for a talking point. That’s an excellent idea with the buttons Mariana. I’ll definitely keep those suggestions in mind. As for your bunting? Love it dear lady! A little slow living goes a long way in providing calm and peace, even when reading about it 🙂 I love the look of those buttons too. You had a week that I am longing for…Thanks for sharing! 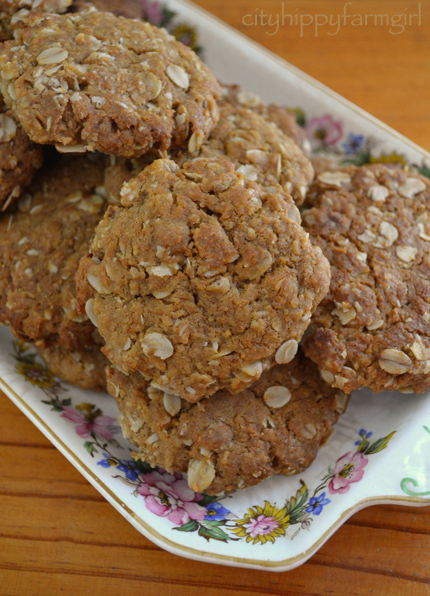 Anzac biscuits are the best, and yours look delicious! I still haven’t tried ANZAC cookies- I tried making them with corn syrup rather than golden syrup and ugh! terrible. I’m going to try again soon, since my niece sent me some golden syrup. I would like to report a similar week- but no- mine has been hectic. Heidi does corn syrup have a taste? Or is it more like glucose, just to bind things together? And you can’t get golden syrup in the US? Fermented cabbage like sauerkraut Christine, (although not really) and Korean in origin. I think I need a new fermenting project so really should give it a crack. The thought of your starter traveling to different kitchens has created such an image in my mind.. That’s just so cool! I really enjoyed visiting you here today.. it’s so peaceful here..